Terrorists in Hamas-controlled Gaza test the long-range M-175 rocket, which can reach Tel Aviv. 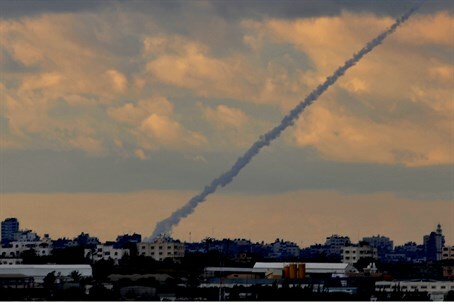 Terrorists in Hamas-controlled Gaza conducted a test using long-range M-175 rockets on Tuesday evening. Rockets of this type are able to reach the central Israeli city of Tel Aviv and even beyond that when fired from Gaza. During the test, the terrorists fired the rockets ​​out to sea, but the explosions were heard in towns near Gaza, including Sderot, Ashkelon, Ashdod and Netivot. The fact that long-range rockets are in the possession of Gaza terrorists is nothing new. During Israel’s counterterrorism Operation Pillar of Defense last year, Hamas fired several such missiles at Tel Aviv and even Jerusalem, all of which exploded in open areas and did not cause any physical injuries or damages. Most of the missiles Hamas fired towards central Israel last year are of the Iranian-made Fajr missile. During the Israeli operation, Iranian Parliament speaker Ali Larijani said Iran had supplied military aid to Hamas, which controls Gaza since taking power in a bloody coup in 2007. The M-175, unlike the Fajr, is a “homemade” Hamas missile.